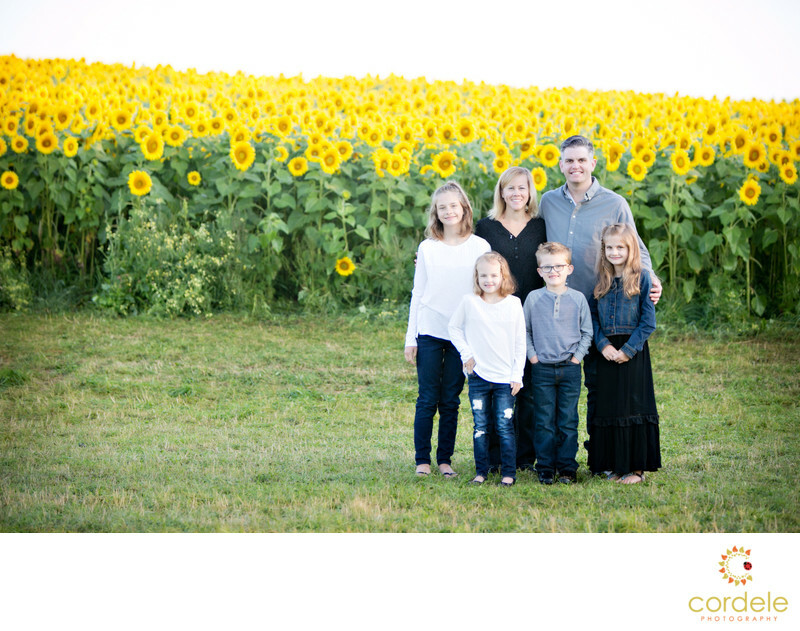 One of my favorite family photos is this one in the Newbury Sunflower patch at Colby Farm. Talk about a location!! These flowers people wait all year to get in front of, and Melissa has been waiting forever to get in front of these photos. Its not like you can drive up at any time. We got up early in the morning and drove to Newbury Massachusetts to Colby Farm. We were lucky enough to get a spot where there were not too many people. This sunflower field photo works because we are not buried in the sunflowers. The light is soft and not too harsh. The sunflowers had just woken up so it turned out to be the perfect time of day to show up! When to expect sunflower photos? The bummer about Colby farm is that the flowers go by SO quick! You wait all summer for them to bloom, when they do you have to go right up! If you don't, you are liable to miss them! Plan to see them bloom late August Early September. If it rains it will ruin the flowers, so hope for great weather. What I really enjoy about this photos is the color choices by the family. The black shirt really draws you in and the white shirts don't deter from the yellow of the flowers. It's hard to find colors that go with Yellow, but the black and white theme worked really well. The negative space on this photo also brings you eye into the entire scene. All to often I see people shoving families INTO the field. I wanted to capture the entire field and the family and give them something to hang in their home. For me, I didn't want to give them a huge close up photo without the ability to hang art in their home. Location: Colby Farm, 50 Scotland Rd, Newbury, MA 01951.